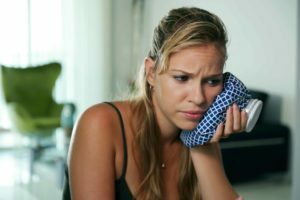 The intense pain you feel from your teeth could be caused by a number of factors. Remember, teeth are made up of living tissue called dentin. Tooth pain is in most cases caused by cavities, which are holes forming on the enamel layer of teeth. The exposed dentin will register pain upon pressure or contact with hot and cold substances. Bacteria will enter through cavities, eventually causing inflammation and infection in the cavity. Gum disease caused by bacteria is yet another cause of tooth pain. Receding gums will expose the roots of teeth causing severe pain. Nerves in the cavity will scream with every sip of hot coffee, every bite of cold ice cream, and will often require a root canal, which scoops out the inflamed pulp and replaces it with a rubbery material, according to the American Association of Endodontics (AAE).